If you’ve ever had to deal with an infestation of lice, you know that these parasites really like to get in there. 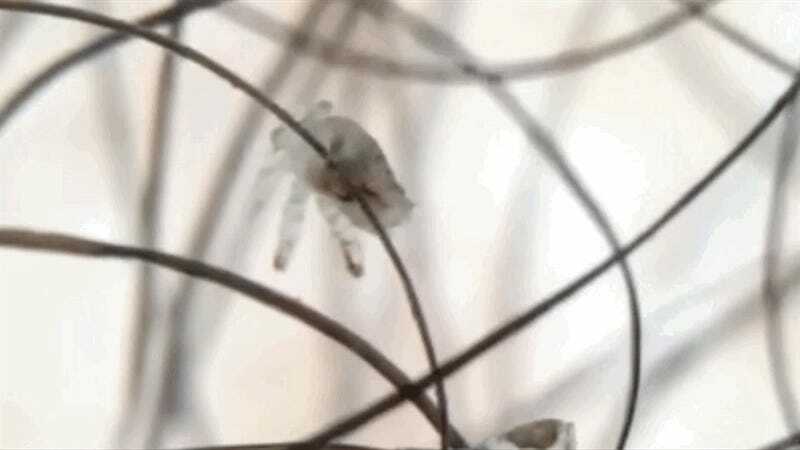 A horrifying new video reveals the mad acrobatic chops that enable lice to make your hair their home, flinging themselves from strand to strand with the greatest of ease. A new case study in The New England Journal of Medicine tells a torrid tale of an unnamed 65-year-old man who showed up at a dermatology clinic complaining of an itchy crotch. On examination, the man didn’t appear to have a rash or any lesions, so the doctors investigated his pubic area with a hand-held dermoscope. The first bit of evidence they uncovered was a nit firmly implanted on a pubic hair. And then came the culprit itself—a freakishly agile, crab-shaped parasite moving from hair to hair like it was nobody’s business. For the dermatologists, it was a classic case of pubic pediculosis—also known as “crabs.” This happens when the pubic louse, Pthirus pubis, infests a person’s hairy nether regions. The doctors prescribed the oral drug ivermectin, and after two weeks the itching was gone. Which is all fine and well—but what about the psychological scars?